Community Glow Walk held in November 2016. Photography by Brittany. This past October, the Northeast Iowa Food and Fitness Initiative and Upper Explorerland Regional Planning Commission kicked off a “Community Walk” pilot program in Decorah. Inspiration for the idea came from the annual Healthiest State Walk, held the first Wednesday in October. Instead of just planning a one-time event for the community, we decided to take it one step further and plan monthly walking events. Explore Your Environment- Each walk explores a new location in the community, a healthy snack, and a creative activity that puts a fun spin on walking to keep families engaged. For example, the October “Community Park to Park Walk” went from a school park to a city park and back. 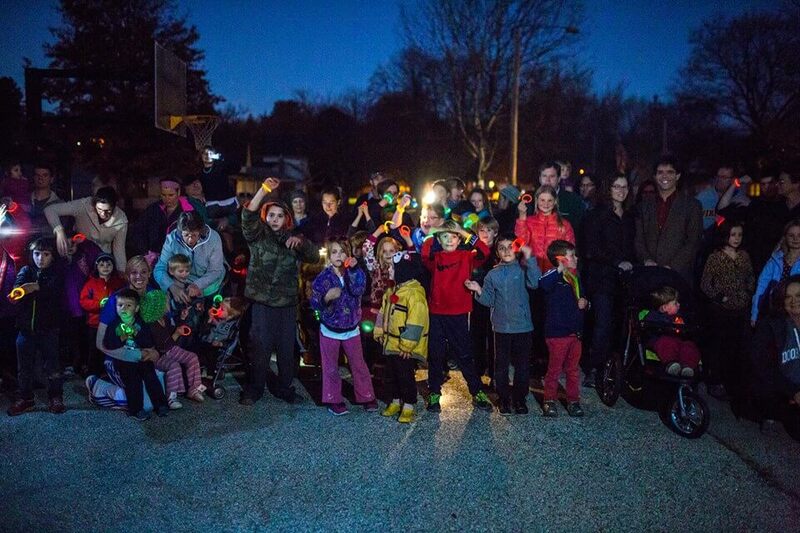 The November “Community Glow Walk” started at a different school park, stopped for a glow-in-the-dark scavenger hunt at a community prairie, and then headed back to the starting location. The December “Community “Try It” Walk” brought together the Decorah Community School District, Reefuel, and B. Fit Studios to offer family activities and a mini-fitness class before walking to another new location. Connect with Your Community- In addition to discovering new walking routes, parks, prairies, and other fun local destinations, Community Walks give you the opportunity to socialize. It’s a great way for both children and adults to meet new people. It’s a chance to get to know your child’s school friends and their families better. It’s a safe and healthy activity you, your family and your close friends can participate in together…plus it’s free and already planned for you! Encourage Healthy Habits- It isn’t a secret that starting healthy habits at young age is important, or that it is easier to maintain good habits than to break bad ones. Walking is one of the best routines to start young since it’s affordable and can be done by almost all ages and abilities. Walking is so important that in 2015 “Step It Up! The Surgeon General’s Call to Action to Promote Walking and Walkable Communities” was declared. Community Walks give all generations the opportunity to “step it up,” enjoy a free healthy snack with their family and friends, and build bonds within their community….a great combination for healthy living! Awesome post!! Keep up the great work!